It's back to school this month, so on this week’s Chat, we’re talking children’s literature. 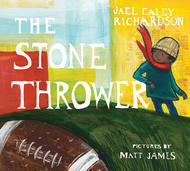 I’m pleased to be in conversation with Jael Ealey Richardson, who co-wrote The Stone Thrower with illustrator Matt James. The book recounts the story of her father, renowned CFL quarterback Chuck Ealey, and the meteoric rise of his football career against a backdrop of racism and inequity. CanLit for Little Canadians called The Stone Thrower “a story of grit, visual and inspirational, in its truest form while Quill & Quire said the book is " ... an inspirational true-life tale that will resonate with dreamers big and small." Trevor Corkum: The Stone Thrower is an adaptation of a memoir you wrote about your father called The Stone Thrower: A Daughter’s Lesson, a Father’s Life. How did that project make the journey into a children’s book? 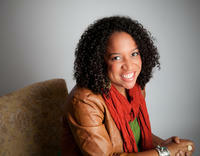 Jael Ealey Richardson: A friend actually mentioned the idea for a kid’s book after the memoir came out. She’s a teacher-librarian at an elementary school in Brampton, and she told me that she wished she could share the story with her students. She said it’s really hard to find children’s stories that feature black Canadians. I mentioned it to Janice Zawerbny, my editor, and she passed my name along to Sheila Berry at Groundwood Books who played a really important role in shaping the story. TC: The book deals with your father’s life as a boy—his childhood in a segregated community and his development as a legendary football quarterback. Why was it important to you to tell your father’s story to younger audiences? JER: On a fundamental level, there’s something really important about my father’s story. It’s about working hard at something over and over again, even when the immediate benefit of that action isn’t clear or obvious. It’s about overcoming obstacles. It’s about pursuing excellence in the midst of hard times and seemingly impossible circumstances. I think these are things we all want to teach our children. We want them to grow up in better circumstances, but we also want to teach them to be resilient. I think The Stone Thrower, and my father’s early years in particular, provide a really practical example of what it looks like to dream big and pursue those dreams with fierce determination. TC: Can you talk more about the process of condensing the memoir into an entirely new genre? What were the greatest challenges? What were the greatest rewards? JER: The hardest thing about turning a memoir into a kid’s book—especially a nonfiction biography—is picking which part to tell. The memoir has over 250 pages; the children’s book had to be 1,000 words. I knew that the winning streak was the most exciting part of my dad’s life, and in the first few drafts I tried to work it in. But the winning streak isn’t the most important part of my father’s story. There’s a sense that growing up poor or getting bullied or mistreated are insurmountable obstacles. I want kids who grow up in difficult times to know that there’s real hope that things can get better when you practice hard in school and outside of school. It’s a great story that I feel really fortunate to be able to share. There’s a sense that growing up poor or getting bullied or mistreated are insurmountable obstacles. I want kids who grow up in difficult times to know that there’s real hope that things can get better when you practice hard in school and outside of school. TC: In addition to your writing career, this past year, you founded the highly successful Festival of Literary Diversity (FOLD), focusing on showcasing the work and voices of a more diverse community of writers than those at traditional festivals. Why was it important to develop the festival? What are your plans for FOLD in the coming years? JER: I love books and I love literary festivals, but when I started to attend festivals as an author and as a member of the general public, there were things I noticed right away. Sometimes I was the only person of colour in the room. Sometimes I was tokenized and made to feel that I was not qualified to speak about writing. Sometimes I was told, pretty overtly, that my book and my work were not of interest to a bookseller or festival programmer. But on the occasions where I did get to speak or talk about my book to an audience, I found that readers were really receptive to what I had to say. Oftentimes, my book sold out. I realized that there was some sort of disconnect between how booksellers and festival planners were responding to my work and how readers were responding to my story. I realized that there was some sort of disconnect between how booksellers and festival planners were responding to my work and how readers were responding to my story. I spoke with other authors of colour and authors from marginalized communities and they confirmed what I felt—CanLit spaces weren’t inclusive. People of colour were rare and disabled writers even more so. At the FOLD, we try and think about what people want at a literary festival and what they need. We include topics that open up conversations on a wide range of topics. For FOLD 2017, our goal is to do what we did last year, only better. We want to finetune how we plan and execute the program. We also want to find sustainable ways of financing it so that we can put a full-time team in place. There’s way more work that needs to be done to expose people to a diverse range of great, Canadian stories, but we have a long game in mind. TC: Back to The Stone Thrower, what’s a question no one’s asked you about the book, that you wish someone would ask? And how would you respond? I think a lot of people don’t realize that, for authors like me, writing a kid’s book is a collaboration. Only it’s not a collaboration with someone of your choosing. Matt James illustrated The Stone Thrower, but we didn’t meet until the book came out. I was told that he would be the illustrator, and I was happy because he had more experience, but after I finished writing, I had to wait more than a year to see what the book would look like. I saw a few pages in the draft stage, and while one page was so beautiful I almost cried, there was also some concern over how one of the pages might be interpreted. It all got sorted out, but it was strange to work on a project with someone I didn’t really get to work with, but that kind of makes the end product even more magical and meaningful to me. From The Stone Thrower, text copyright © 2016 by Jael Richardson, illustrations copyright © 2016 by Matt James. Reproduced with permission from Groundwood Books, Toronto. Jael Ealey Richardson is the author of The Stone Thrower: A Daughter’s Lesson, a Father’s Life, a memoir based on her relationship with her father. The book received a CBC Bookie Award and earned Richardson an Acclaim Award and a My People Award. Excerpts from her first play, my upside down black face, are published in the anthology T-Dot Griots. Richardson has an MFA in Creative Writing from the University of Guelph. She lives in Brampton where she serves as the Artistic Director for the Festival of Literary Diversity (FOLD).